Isn’t the outboard flap section big enough? Tell me a more or less convincing script in how this piece could have been planted. Then there can be reason to ‘dogpile’ maybe, not sooner. At end of route, I think the A/P is still engaged. The stability question comes in if the A/P is just turned off, would the plane fly itself without a pilot? Seems probably not. I guess it won’t suprise you and others that I appreciate his newest paper. Therefore unnecessary to say perhaps from my point of view he brings in strong data and arguments with his latest paper. Nice to read also he has taken almost everything into account. Also a lot of issues that where put on the table by Jeff and discussed here. Statisticcaly sound and based on current data and facts. This is the way to go IMO. Big compliment to Godfrey’s work from me. The outboard flap section, and all of the pieces discovered so far were small enough to carry on a small bass boat. You’re telling me that there’s not a 777 lying around in some boneyard that could have served for this particular scenario? Hell, these pieces could have been salvaged from mh17 for all we know. Just entertain the thought for a moment. I just have this gut feeling we haven’t seen the last of 9M-MRO. The outboard flap section was 100% positively identified belonging to 9M-MRO. The flaperon also and the left wing outboard flap trailing edge too. They were not from MH17 or any other B777. These are the known facts. If you want to deny them and choose otherwise you have to come with facts or arguments equaly strong. If you cann’t provide those you are senseless speculating without good arguments. Gut feelings are not of any help in this case without any reasonable explanation based on current facts and data. The weirdest scenarios have past through this blog (and still do) but all still discussed are still discussed because excisting data and facts were taken into account underlined with reasonable arguments. Oke, our honoured moderater sometimes decides to delete a poster. Sometimes this is questionable in my view (@Oleksandr f.i.). Come with detailed arguments I suggest. How strange they might seem. The topic is after all called: Triumph of the Weird! @Ge Rijn, Compared to the sophistication of a BFO spoof operation, planting a few pieces of the plane would be trivial. All you need to do is lop off some chunks, stew them in the sea for a while (or not), and put them on the beach. I’ve struggled to understand why some people consider the notion of planting so outlandish. Indeed, before the flaperon turned up, some people suggested that the absence of debris was an argument against a spoof scenario, since it would be such an obvious way to bolster the appearance of a turn to the south. ADDENDUM: I see that Tex was talking about planting pieces if you didn’t have 9M-MRO on hand. I agree with you on that score, I think the case is very strong that the flaperon is not just from some random 777. @Tex. Are you seriously suggesting an aircraft part, >2m long and over >1m wide is suitable aged/deformed/distressed/bio-fouled, imported into Tanzania by nefarious means without detection, loaded into a “bass boat”, driven offshore >50NM to somewhere east of Pemba offloaded in the hope that it sticks onto a convenient bit of rarely-visited coastline (oceanic, wave-eroded coral overhang) so that it will be found by some fishermen? And that is just one of multiple bits of debris? Gimme-a-break. Look guys, Im not trolling here, or trying to get banned. I just think we need to start milling over other possibilities. I’ve been lurking on this blog since the beginning, and I absolutely admire the effort ( math, and sciencey-science stuff) but all that hard work hasn’t seemed to produce any evidence, save a few chunks of the supposed plane. WHAT IF the plane were to bank and go North? What are we looking at in that scenario? Fugro, and every other searching party bilked the ATSB out of 150mil shells. I think anything is a possiblity at this point. Nothing should be ruled out. We live in a world where some guys were able to take over two planes with just box cutters, and fly them into the heart of NYC. Fast forward 16 years, and put some technology into someones hands, in which they intend to do harm. Can you still tell me that it’s a 100% certain impossibility that this plane didn’t go North? @Tex, You’re definitely not going to get banned for entertaining the possibility that the plane didn’t fly into the SIO! @Paul Smithson, This is not at all hard to imagine. Not only the flaperon but also both outboard flap pieces were confirmed 9M-MR0. And most probably the majority of the other found 22 pieces are too. I’ll come back on explaining the difficulties/impossibilities in planning and executing a planting operation over such a time frame and area from Tanzania to South Africa including the Islands, unseen and undetected soon after the Inmarsat data came available and according to drift analyzis that came available much later. It’s just so complicated and far fetched without any evidence yet to consider seriously against all data and evidence that is just at hand but anyway I’ll give a shot at it. After very sophisticated people with very sophisticated technique, horrible amounts of money and very sophisticated projections, based on some data points failed dramatically, the probability, that those data were spoofed has risen considerably. Its part of the new situation, that this also supports the probabilities for planted debris. Given the long story of “convenient” incidents in the course of the disappearance, i would consider that the whole mystery is no mystery at all, but one, that someone wants to appear as one. This started from the very beginning with the employment of spin doctors, and did not cede until today. There is all kind of fog around. We should not let that blind us. There is something to investigate. Dont let you be intimidated by some employees of known Troll factories. Regardless of what fate ultimately befell MH370, anyone who thinks planting debris in the ocean is not a plausible scenario for a disinformation campaign, needs to familiarize themselves with WWII’s Operation Mincemeat. Not only is it possible for debris to be dropped off-shore to stick onto a bit of coastline to be found by some fisherman, as you put it, it has, in fact, happened. As part of an Allied plot to confuse the Nazis, it was completely effective and remained undiscovered as a ruse until 60 years after the war ended. That debris was not bio-fouled, but certainly suitably distressed and aged and otherwise doctored and, yes, launched without detection. So whether or not you find such action possible is irrelevant, because history has already shown us it can happen. As for multiple pieces of debris—rather than cast doubt on the possibility, it only increases the likelihood that some of it would make it to shore. Whether such a scenario was part of the aftermath of the demise of MH370 is, of course, another story. @Jeff. The part of me that abhors gratuitous click-bait sensationalism wonders if you are just yanking our chain. The part of me that appreciates your relentless trawl of factual evidence makes me wish you wouldn’t go there. I’ve always had a hard time swallowing what Inmarsat was feeding us. I feel that they can’t afford to be wrong, they’re livelihood depends on it. What’s your take on this? Thanks for providing the reference to the FAA Pilots Handbook of Aeronautical Knowledge. For those interested in other manuals, here is a link to the FAA aviation manuals. I recommend Aerodynamics for Naval Aviators. This is a classic – old but still very good. Thanks for the Wichita State thesis – very interesting project. More detailed than a casual reader would appreciate – but I trained as an aeronautical engineer with focus on stability and control. Thanks for the link. Re: Do you know? inherent stability question. I was wrong about the roll control axis in the 777 using a roll rate command system (like airbus) rather than direct control of the aileron/flaperon angles. So with hands off, the controls will remain fixed at neutral and it will only be the inherent stability of the aircraft that would keep the wings level. My belief is that a wing will drop and some vertical lift will be lost. The dihedral effect will attempt to level the wing but the tail will weathercock in response to the side slip and the nose will point into the turn. If the tail effect is more pronounced than the dihedral effect, spiral divergence will soon result in a near vertical dive. If the dihedral is more dominant than the tail, the aicraft will just wallow back and forth in what is called a dutch roll mode which will eventually damp until the next gust. Light planes that I have flown have very effective vertical tails and spiral divergence is what happens. The model glider exhibits the dutch roll behavior. The ATSB report and Boeing simulations seem to show a classic spiral dive when the autopilot disengaged at Arc 7. It seems that without a pilot at the controls or the autopilot engaged, the 777 will just roll into a death spiral. P.s this part was terrifying..
@Tex, I’ve talked to some of the guys at Inmarsat and I think they’re on the up-and-up. They really struggled to make sense of the BFO data for a long time–which I don’t think they would have if they cooked the whole thing up from the get-go. @Paul Smithson, You think the spoof theory is sensationalistic? 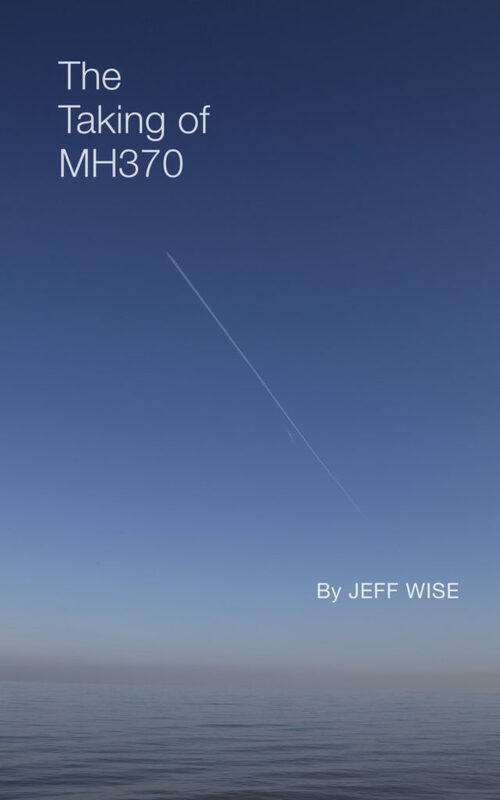 As I argue in this post, every remaining option for MH370 is weird. Your choice is between an outrageously, unprecedentedly sophisticated act of malice or an outrageously, unprecedently implausible convergence of coincidences. There is no eminently reasonable alternative. I do appreciate the “relentless trawl of factual evidence” part though. It takes almost an hour but worth watching. It is also posted over on Reddit. It is good and interesting…I did not agree with some of the slant but it is better than I thought. @Susie Crowe. Thanks. This is listed as a reference in Kenyon’s 3rd update of his flaperon analysis but that was in French. It was from whence he obtained the photo of the broken outer actuator attachments, skin cover removed, seen at the film’s 46:00. (The photo is in fact upside down). In English is a help. @Ge Rijn. I had not apprehended that Blaine Gibson discovered metal embedded (the film’s 11:15) in the composite panel he had just found in Madagascar. The provenance of both metal and panel I assume would be wing. It puts me in mind of earlier discussion about the skin penetration damage to so many parts recovered. I see this (metal fragments) as more likely the result of a shock separation (“All at once and nothing first”) at high speed and incidence angle than a ditching. I assume the ATSB will have something to say about it. What should be the upper limit on monies spent on the search? One billion? More? Less? How do you think the money is split…salaries, maintenance, rental, profit? How many companies realistically have the capabilities to participate in the search? Paper by Ian D Holland of the DSTG on BFO calculations. OXCO drift discussed. Aside from BFO aspects, his paper concludes a downwards acceleration of .68g. He may not have considered a steeper nose down without much acceleration. Continuing this line of 9/11 thinking if 9M-MRO was to be used to avenge the loss of Osama bin Laden then who was responsible for this? Clearly not POTUS, even if he signed the orders. Given possible Ukrainian separatist expertise in a 9M-MRO hack then maybe Russia panicked (is this possible?) and downed 9M-MRD as a warning. With regard to the possibility of various “planting” scenarios. I think Tex has to be taken seriously, I think we should hold back a bit on being dismissive of the idea, since, it is neither as difficult or as impractical as some seem to think. Firstly NONE – repeat NONE of the items found so far, have been incontrivertibly prooven to have been fitted to 9M-MRO “when it pushed back from Gate C1 that night”. All sorts of components, Flaps, Flaperons etc, many many components, get damaged in service, and are replaced / swapped out / condemmed and disposed of, or are repaired, recertified, and go back into the spare parts inventory. I repeat, not one single piece so far, has been incontrivertibly prooven to have been fitted to 9M-MRO that night. So, I think it can be taken as given, that, hypothetically, “if” planting is occuring, it is / indeed it must be / indeed it could only be, a “nation state” activity. Moreover, if you wanted to plant debris, you would need the actual wreckage material, OR, a source of “suitable” material. When you think about it, there is plenty of condemmed material to be found, if you knew where to find it, and had the means to covertly “acquire” it. The next step is the actual transportation and planting. You would need to do so covertly and directly, you would not be carrying any of it around anywhere in public at all. Moreover, maintaing secrecy, even “in your own house” would be vital, so it would need to be a strictly “need to know only” operation, and involve as few people as possible. So, “if” I were planning or directing such an operation, (noteing that all the possible nation states involved have a Navy, and all of them have submarines), I would be using the “silent service”. The planting of small items on beaches could easily be done covertly by divers from a submarine, in a few minutes, at night. Larger items would be a bit more “problematic” with respect to possible “detection”, as in getting “caught in the act”. Indeed, the mere fact, that the “by far biggest item” so far found, ie, the outboard flap, was found in an “inaccessible location, visible only from the sea, and retreived by fishermen” is a tantalising verification of the required methodology. Such things have been done in the past. Indeed, as ScottO reminded us, there was a famous operation in WW2 that did just that, using a dead body. When the operation was declassified after the war, one of the officers involved wrote a book about it, and it was later made into a movie. So I think we need to maintain an open mind on this. We have been so “coditioned” by the ISAT data, that most people accept it as gospel. More than ever, I think it needs to be “questioned”. I have long thought that the BTO’s may have been misrepresented, and if so, it becomes a whole new ball game, with simply massive implications. Having just read Holland’s paper, only once, quickly, the thing that “leapt off the page” is Table 1, and accompanying text, re “19:41Z (alternate)”. IMO this is really significant. I did not know about embedded metal found in debris too. Thanks for pointing this out in the link. Of course the most important question is; what kind of metal is this and where did it came from? A shock- all at once impact won’t leave time to cause the big differances in speed between parts of debris towards eachother to cause this kind of damage IMO. And as you mention this kind of cuts and scars is seen in many pieces discussed a long time ago. The Blaine Gibson piece showed is one of the suspected closing panels above a flaperon that was not collected by the Malaysians for a long time. Why not? If there is really an embedded piece of metal there that punctured the skin it rather could be a very important clue. It’s alarming IMO we never heard anything about this from the investigators. My interpretation of those cuts more then a year ago seem to hold water afterall. Crucial this becomes clear to the bottum. Is it a piece of engine-blade? A foreign object (shrapnel?) that embedded itself? Very important questions that should be answered IMO. The Holland paper is very interesting, and it will take some time to understand fully. For the moment I note that reference  is an internal report of the “MH370 Flight Path Reconstruction Group – SATCOM Subgroup” and is not publicly available, yet it is cited 7 times in the article. It would be great if this report were made public. Second, the logon at 18:25:17 is discussed extensively in Section IV, and new information is revealed that we did not previously know – in particular, the signal strength of the initial message was anomalously low, and the BER (bit error rate) was non-zero. This information had been redacted from the Inmarsat logs, even though people had asked for it. In the interest of transparency, it would be useful to have the logs re-released with all fields provided. shall initiate a log-on via the procedure of 9.3.3.3 if the AES cannot re-establish sync. It would be even more useful to have the ISAT data plus ACARS from the previous 20 flights of 9M-MRO. I am much more interested in the behavior of the data than I am in BER or CNo. Yes of course ACARS from prior flights great idea…I’ll add that to my list…just an example of many data points we do not have. I can think of no possible reason that data could not be placed in the public domain. Withholding it reprehensible, IMO. Even better would be the BFO error computed by the DSTG as well. I know if the data gets released you bastids will stick me with calculating the BFO error on 1000’s of data points. I will cry like a little girl. Yes, a full examinatiin of all computers that interpreted the BFO data would be an excellent idea. But that still wouldn’t tell us if the data was spoofed, or would it? A serious spoof would be just about impossible to detect if it was at the source i.e. on an aircraft (9M-MRO or a dummy aircraft) or a sophisticated ground based spoofer. Whether information might be material to someone else is a question about which those making a data release can sometimes be a poor judge. Every little bit helps for sure. Don’t know why this has to be so hard. We are not asking for state secrets here. Perhaps the high BFO error at logon would be related to the secondary spoofing “dummy”-aircraft just coming slightly ahead or slightly behind the intercept location to take over as source of the BTO/BFO data that we have public. The new report by Ian Holland says the SDU relogon at 1825 behavior looks similar to prior MH370 SDU reboots, so that probably starts to say spoof is unlikely. @TBILL – it could be the spoof via secondary aircraft was already in progress before the reboot.. even near IGARI, but the deviations is when there is separation is great enough to be noted by imperfections in the spoof method. the holes in radar coverage could be from a radar blocker. @Ge Rijn. This and the flaperon have their cuts mostly on top. The hole in the left flap trailing edge has a hole which, flaps up, is apparently from below, to the rear and inboard. The only explanations I can think of are either that it was pierced after separation/rotation, or the cause was an engine projectile. A separating turbine blade on failure or a few should be contained but a sudden engine smash up might be another matter. Yet the ATSB findings on this (Debris Report 5) are restricted to its provenance. There is no remark about that hole. I said about the metal in the closing panel, “I assume the ATSB will have something to say about it”. Since they said nothing about the flap hole or the likes of the cause of “No Step’s” top skin separation and the alloy honeycomb corrosion (compatible with the time in the water? ), that hope is forlorn. Then there was to be the examination of marine growth removed at quarantine of at least one item. The examination had been slow and it now appears stopped. There has been criticism of Malaysia’s efforts in beach search and debris collection. There are like grounds for criticism of ATSB efforts in debris inspection scope, timeliness and communication. This is similar to the findings of Jansen et al in their peer-reviewed paper. IMO a better match to “my” end point (-30.9) than the direct McMurdo route by Godfrey/Iannello (-26.9). I shall include this in the updated version. Dr. Holland’s paper does not account for the fact that the BFO at 18:25:27 is virtually perfect relative to what we think we know about the aircraft position, track, and speed at that time. The subsequent BFO values are certainly representative of a gradual return of the AES oscillator to a nominal frequency bias. Holland’s thesis requires the 18:25:27 BFO data to be discarded. OK re: SDU just seeing if I could get away with that conclusion. Victor advises me (since I keep asking why IG/ATSB have no prob with routes thru Indonesia air space near Sabang) that the common assumption is Indonesian radar is off on weekends and Z would have known that).